When I think of fuchsias, I think of the narrow reddish purple blossoms of my Grandma's shrubs in Brookings, Oregon, and my Mom's collection that grew on the east side of our little house on the Northern California coast. Mom's fuchsias were sheltered on the east by a 6-foot-tall fence and tall cypress hedge and on the west by our house. They thrived in the cool, moist climate and bright light, sheltered from the wind and sun. Fuchsias (Fuchsia spp.) are small trees or shrubs found primarily in the Caribbean, Mexico, Central and South America, though there are a few species native to New Zealand and Tahiti. The tender plants are generally winter-hardy in USDA zones 10 and 11, though Mom's thrived in their sheltered zone 9 location. A few hardy species survive down to zone 6. 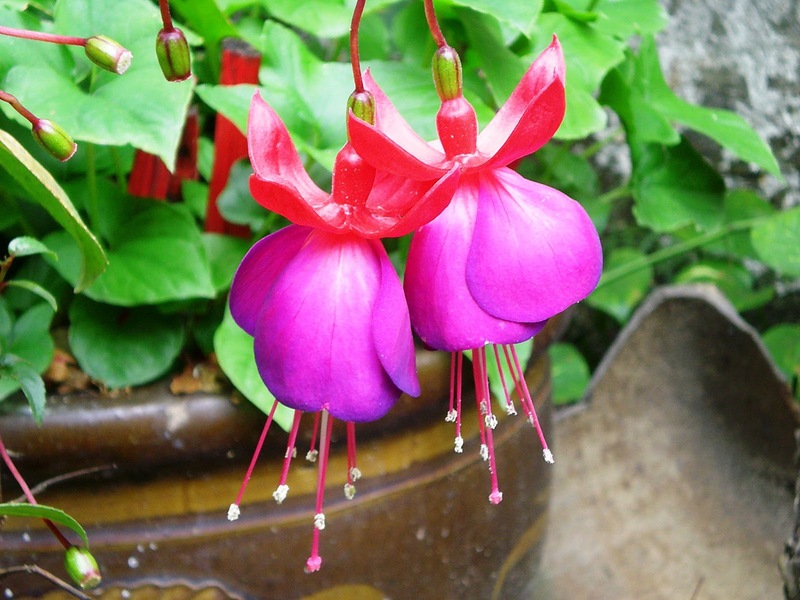 While you can purchase fuchsias, they're easy to propagate from stem cuttings. Simply take 2- to 4-inch cuttings of growing tips. Strip off the lowest leaves and swirl the stem in rooting compound, if available. Insert the stem into moist sand, perlite, vermiculite or soil. Use bamboo sticks to suspend plastic wrap above and around the cutting and its pot. Snip a couple of small holes in the plastic for ventilation. Place the cuttings in a warm, bright location, but avoid direct sun. A window covered by sheer curtains will diffuse the sun's rays adequately. Once the cuttings establish roots, in three to four weeks, remove the plastic wrap. Keep the soil moist, but not waterlogged as the plants develop new leaves. Transplant into flowerpots, hanging baskets or in a sheltered, light or dappled shade location in the garden. 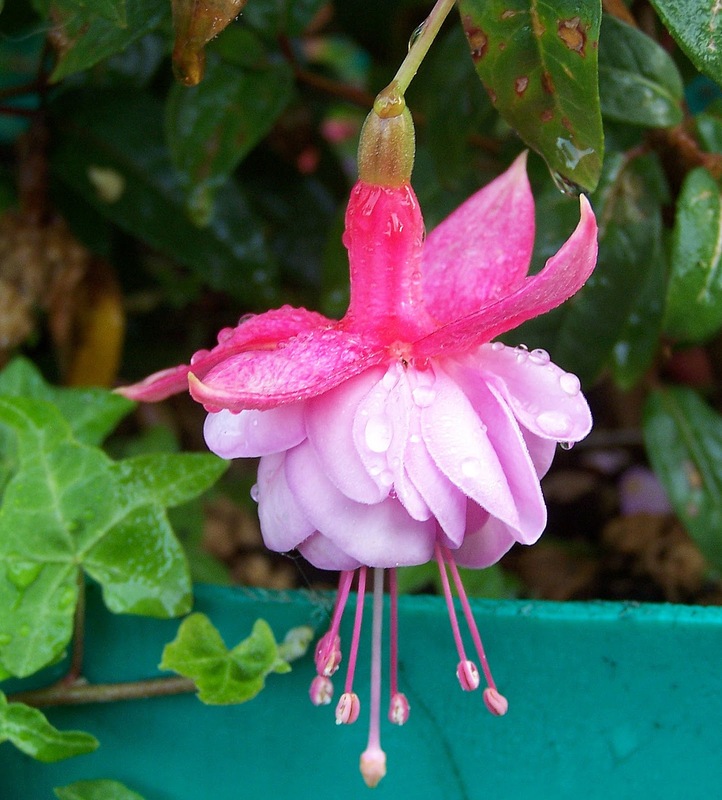 In general, fuchsias prefer temperatures between 50 and 70 degrees Fahrenheit. When the weather heats up, move the plants into deeper shade and protect from drying summer winds. Water fuchsias when the soil is dry to the touch. Check potted fuchsias daily, especially in hot weather and water as needed. Fertilize every one to two weeks from spring until fall with a 20-20-20 liquid fertilizer solution. Use 1/4 teaspoon of fertilizer in 1 gallon of water. Water after fertilizing to prevent the fertilizer salts from damaging the tender roots. When frosts threaten in fall and winter, take the fuchsias inside. A sunny window or enclosed porch that stays above freezing will allow the fuchsias to overwinter indoors. Protect fuchsias in the garden from frost with sheets or plastic suspended on bamboo poles and anchored to the ground with rocks, bricks or lumber. Do not allow the covering to touch the foliage. In addition to their beautiful blossoms, fuchsias attract bees, butterflies and hummingbirds. Wonderful article for the gardeners among us! I love fuchisas! So do my hummingbirds and butterflies. Every time I plant or hang them, they're full of hummingbirds. Great blog. I didn't realize they could be propagated from cuttings. I'll keep that in mind the next time I have one. Today on #OurAuthorGang, Ruth de Jauregui​ gives us some great gardening advice. Lovely article, Ruth. I love fuchsias, and we have some here at my condo building. One of the few flowers we have. As for growing them . . . the only thing I've successfully grown is a bigger belly, lol! 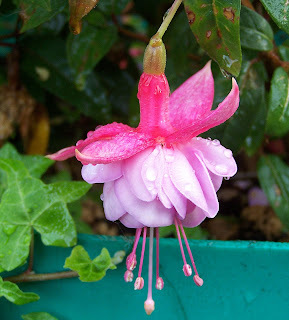 My own contribution to #OurAuthorGang -- how to grow and care for fuchsias. Stop by and learn how to propagate and grow these beautiful flowers. Lots of information Ruth. I love fuchsias! I think I will try to grow them inside here at home. Awesome article, Ruth! I've worked in the floral/plant industry for over 30 yrs...and never was taught much about the fuchsias..Good to know how to propagate them! Such a delicate flower! You have provided such valuable information here on the care of these beauties. I may attempt at planting some myself. Thanks for the info. I've always loved fuchsias. Yes, Fuchsias are one of my favourite flowers. Great tips on how to grow and propagate these beautiful plants. Thanks Ruth. I love Fuchsias, one of my favourites!! Your post makes me wish for a bigger garden! !